but am only sorry that you were lonely. you have grown stronger in solitude. but it has not diminished. Come home and sleep by the hearth. but I have no more home with you. It was selfish to send you away. It was cruel to send me away. and a magician fears the company of his own thoughts. Do you mean you are sorry to be alone? How did you know she had left? so we may judge how strong you have grown in solitude. Our love for you is changed but not diminished. Come and eat with us at our table. and has a place for you by the hearth. Gillian Daniels writes, works, and haunts the streets and parks of Boston, MA. Since attending the 2011 Clarion Science Fiction and Fantasy Workshop, her poetry and short fiction have appeared in Strange Horizons, Apex Magazine, Electric Velocipede, Andromeda Spaceways Inflight Magazine, Flash Fiction Online, and PodCastle among others. She reviews plays and concerts for The New England Theatre Geek and tweets on a fairly consistent basis as @gilldaniels. 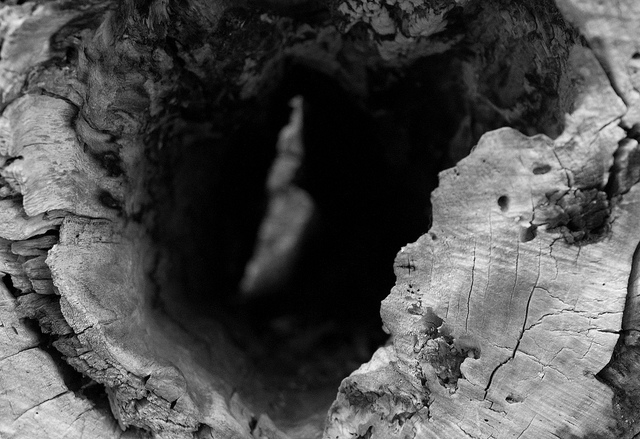 Photography: adapted from Hollow Tree, by Harsh Patel.